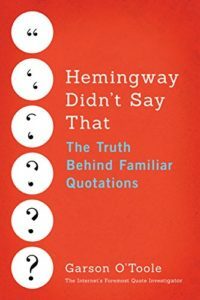 QI hypothesizes that the words above originated as a paraphrase of the 1962 quotation. The statement was then mistakenly elevated to the status of a quotation. Yet, it is also conceivable that Baldwin employed the version above in some location which has not yet been identified. Baysa’s essay concludes: “James Baldwin stated that the purpose of art is to lay bare the questions that have been hidden by the answers. Each viewer addresses the works differently, with an amalgam of context and encoded attitudes. Edgar H. Sorrells-Adewale (b. 1936), who also teaches at Howard, speaks chaotically but compellingly of the inhuman condition of much of modern life in his installation “Haiku for Esu” (1997). He quotes James Baldwin’s pronunciamento that “The purpose of art is to lay bare the hidden questions, which have been hidden by the answers.” The centerpiece of the installation is a computer keyboard, which is plugged in but not really connected, just like real life. This last element may be crucial, for it suggests one important purpose for engaging in the creation and consumption of both art and arts-based research. This purpose is perhaps best expressed in the writer James Baldwin’s (1962) definition of art. Good art, he says, is capable of “lay[ing] bare questions that have been hidden by the answers” (p. 16). QI does not know the source of the quotation immediately above. The accompanying bibliographic note pointed to the 1962 work “The Creative Process” by Baldwin, but the quoted phrase differed from the statement in the 1962 essay given at the beginning of this article. Perhaps Baldwin published two different versions of the essay in 1962, but QI has not yet found evidence to support this possibility. In conclusion, James Baldwin should receive credit for the words he wrote in his 1962 essay. A reformulated version of one of Baldwin’s thoughts has been attributed to him. QI does not know who created this variant statement which began to circulate by 1991 or earlier. In addition, a second variant with the word “occluded” instead of “hidden” has entered circulation in modern times. 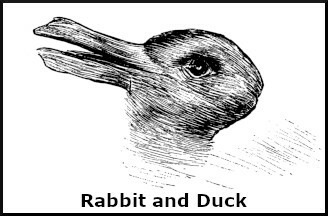 Image Notes: An ambiguous image depicting a duck or a rabbit from the October 23, 1892 issue of Fliegende Blätter. Image has been resized, cropped, and retouched.